When we learned that one of our incredible campers, 15-year-old Avalon Theisen from Tampa, Florida, was going to be attending the international UN Climate Change Conference in Paris, we knew we wanted to hear all about it and share it with our YEA Camp community. Avalon is an incredible activist. She started an environmental nonprofit organization, Conserve It Forward, when she was just 9 years old(! ), she gave a TEDx talk when she was just 12(! ), she has spoken about climate change at the White House(!) and won many awards, and was recently featured in this fantastic article from the Unbound Project. In short, Avalon is one of the most dedicated environmentalists we know at any age. 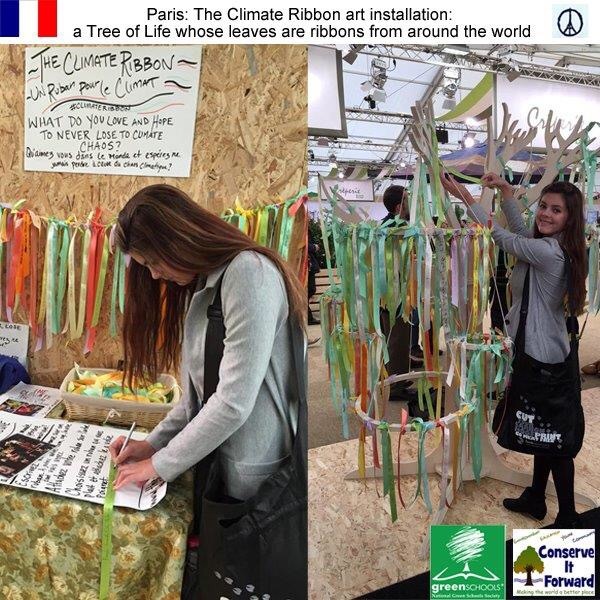 As part of her role with the Green Schools Project as a National Green Student Leadership Council Officer, Avalon attended the “COP21” Climate Change Conference in Paris. We are grateful for her sharing her personal story about her experience. Reading it, we almost feel like we were there! We are so glad that she could advocate on behalf of our planet and speak on behalf of young people at this important event. I arrived in Paris on a cold winter day. A nervous excitement bubbled inside me as I stared into the clouds, hidden by the sun. Signs advertising COP21, the United Nations Climate Change Conference, dotted the landscape from the tall buildings near the airport to the city signs on the Champs-Élysées. With only an hour’s sleep the night before, I was exhausted, and was powered only by my imminent anticipation. Just a few short weeks before, I had been invited by Green Schools to make a video about the importance of youth at COP 21 events. I am a Green Schools National Youth Council Delegate, as well as the founder of a small environmental non-profit organization, Conserve It Forward. Shortly after the videos, Green Schools invited 5 teens to go to Paris. 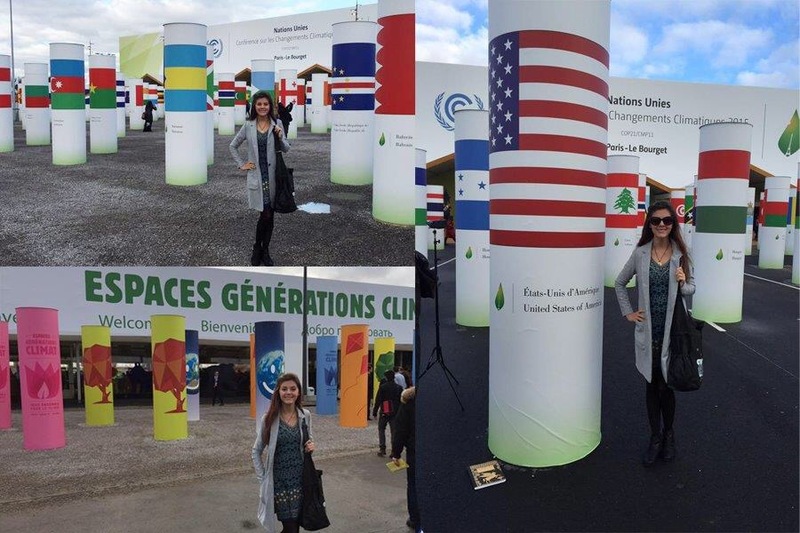 I was so happy to be representing Green Schools and Conserve It Forward at COP21 and related events. I started a GoFundMe page right away, including the video I made and a letter I wrote. Thanks to many very supportive people, I quickly raised enough money for both my expenses and some amazing thank you gifts to give out to donors. 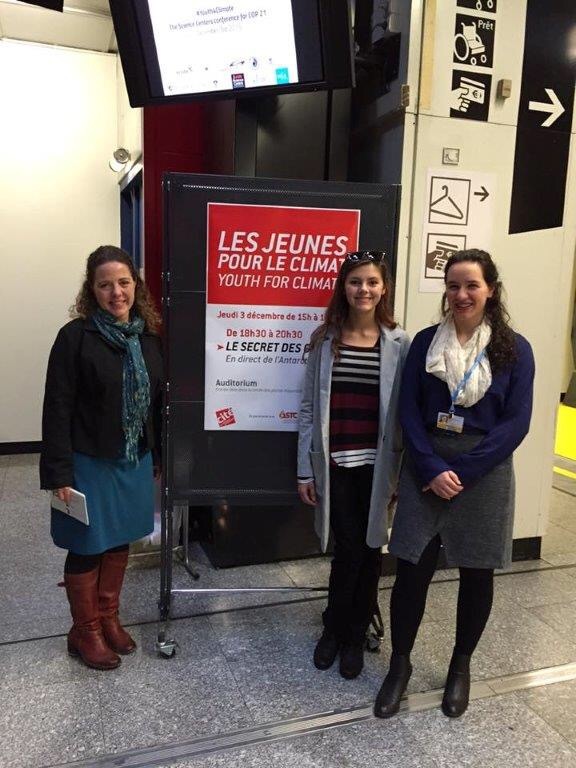 Once we arrived in Paris, we headed to the Cité des Sciences et de l’industrie for the Youth for Climate event, which was organized by the Association of Science-Technology Centers (ASTC). Coincidentally, I had sat on the first ever youth panel at the ASTC Annual Conference a year ago. Upon arriving at the event, I met Jen Kretser, Director of Programs at The Wild Center and the lead organizer of its annual Adirondack Youth Climate Summit, and Gina Fiorile, an intern at the science center who has been recognized by the White House for her commitment to environmental causes. I had met both of these ladies when we were all at a climate event at the White House in February 2015. I was happy to see some familiar faces right from the start. During the evening, we heard from many other young people from across the globe with similar environmental goals. I was happy to hear that teens from India and Finland also supported and included some form of a plant-based diet in their presentations and speeches. I strongly believe that what we eat affects climate change, so this was exciting for me. We heard from several science, environmental, and COP21 leaders. Some of them included Walter Staveloz, the Director of International Relations at ASTC; Frank Niepold, Climate Education Coordinator at NOAA; Karuna Singh, Country Director for Earth Day India; Owen Gaffney, Communications Consultant of “Future Earth,” and Jean-Pascal van Ypersele, Climatologist and Former Vice-Chair of the International Panel on Climate Change. There were also interviews by Frederic Castel directly from Bourget of people, including Pierre-Henri Guignard, Secretary General for COP21, and Celine Ramestein, Project Manager for COP21. After the event was over, I had the chance to speak with Solene Dengler from CliMates. The next day was Friday, and, though tired, I was very excited to start our day. We went to Le Bourget where the main conference was being held. For those without credentials, there was an enormous conference area full of exhibits, booths, activities, media, and so much more. The event was huge, and almost all of the decorations were made of recycled materials. It was amazing how many people were there, how many languages spoken, and how many people and organizations were represented in a single venue. Some of the booths and organizations we visited were the Climate Reality Project where we met David Ellenberger, the World Wildlife Fund, Youngo, and even an entire section dedicated to agriculture affecting the world. My mother and I raced on stationary bicycles to power common appliances at the WWF booth. I loved this idea of exercise to create the energy we need. Later, I participated in “The Climate Ribbon art installation: a Tree of Life whose leaves are ribbons from around the world” where we wrote messages on ribbons about things we never want to lose due to climate change. Then we tied the ribbons to the tree. I found out later that 2 of my friends from Youth Empowered Action Camp (YEA Camp), Ananya Singh and Amanda Houdeschell, had organized a collection of ribbons from their schools in the United States to send over as part of the exhibit. This activity was organized by 350.org and hosted by several other organizations. Our next stop was the Marymount International School, a beautiful school on the outskirts of Paris. Inside an entryway was a theatre, in which waited some of Marymount’s students along with many speakers and guests. A few signs advertised this event as Mini COP21, and I was happy to be included in the lineup of keynote speakers they were hosting over their two-day event. I woke up on Saturday, excitement rushing through my fingertips. This was the day I would give my presentation. I packed my notes and multiple USB drives meticulously, checking at least 3 times to make sure I had not misplaced them.The sun was shining brilliantly despite the cold, and I practically ran out the hotel doors. The trip to Marymount International School was short, and the man at the iron gate buzzed us in immediately. Once past security, my mother and I entered the building where the auditorium was. There were students representing a multitude of schools worldwide. Other guests and speakers were present, and as a whole, we all represented many parts of the world. I was incredibly excited. I was more happily anxious there than in almost any other speech I had ever given. The event started, and there were two presentations before mine. Hearing multiple references to the issue of food choices affecting the environment throughout my time in Paris really gave me hope. This is a new subject for many people, and I want to do what I can to make it common knowledge. It made me feel great to know others are doing the same. At 10:00, I handed a USB drive to the technician, who uploaded my PowerPoint to a laptop. By 10:15, it was my time to talk. Waving happily to my mother, I strode down the shallow steps and made my way to the stage. Two Marymount students introduced me before handing off the microphone. I held it, my palms slightly sticky, and began my speech. I loved the sensation of so many eyes on me, everyone attentively listening, hearing my voice resonate along the walls. I hope to have a link to the video of my presentation soon at the Conserve It Forward YouTube channel. I talked briefly about how I got started with environmental work at age 8, then described what I love most about our beautiful, “common home” (the theme of the day), all things that people could relate to and that are found all over the globe. I spoke of ways that people could get involved and help in their everyday lives, and spent a lot of time talking about the importance of our food choices on the environment. Food choices are a great, simple way to help our world and all living things. Every time we eat, we have the chance to make change for the entire planet by using fewer resources; that means eating more plant-based foods and less animal-based foods. I led everyone in the Human Frog Chorus, which is an interactive demonstration I created in 2012 to show the power of all of us using our voices together. My hope is that I left my receptive audience with something they can use at home. I had a great time connecting with people who came to talk with me afterwards. Soon after, the audience split into working groups. I was happy to get to work with some of the other speakers, students and attendees, including students from Peru and Bali. Our group discussed four problems our local communities and schools faced, and we chose the topic of destruction associated with palm oil. I mentioned Project Orang, a project that was started by two youth, Madison and Rhiannon, with whom I had been part of different programs in the past. A couple of our group members knew about Project Orang already, which was really neat. When the forum came back together, group representatives, including me, took turns speaking about each topic. We had a fun time working and enjoying lunch together. The afternoon brought new speakers, including Kip Anderson, co-director of one of my favorite documentaries, Cowspiracy: The Sustainability Secret. For Earth Day 2015, I gave away almost 80 copies of the movie through my organization’s Facebook page, and I had also communicated with Kip over the past many months. His presentation was full of facts, dotted with a few personal opinions. Some of the information was as follows: animal agriculture accounts for 51% of global greenhouse gasses, those who eat entirely plant-based can save up to 18 times the amount of land a typical American consumes, and the agriculture sector is one of the leading causes of deforestation and water pollution. I was thrilled, again, to have someone else talking about this very important topic. Our last stop for the night was a visit to the free, interactive rides along the Champs-Élysées sponsored by IKEA, in honor of COP21. Their exhibit included playground-like equipment that you could ride to show the power of people to create energy. I thought this was a great way for everyone to take part and have fun. Sunday was our last full day in Paris. We no longer had any events to attend, and while I was excited to get one full day to experience the culture of the city, it also made me sad. I longed to attend more events, to learn more, to see more, and to meet more people. I found it so inspirational hearing the stories and experiences of other people. During events of the day, we visited a public square where gigantic blocks of ice had been placed for COP21 to demonstrate global warming and climate change. We also visited Place de la République, or Republic Square, home of the memorial to those who lost their lives in the November 13 terrorist attacks. Darting through city skateboarders, we found ourselves under a monument, where candles, peace signs, and all kinds of tributes sat. There were still a surprising amount of shoes, left to symbolically represent the demonstrators who were supposed to gather for a march for climate change, but which had been canceled due to the attacks. Looking down at my feet, I spotted two origami peace cranes painted on the ground, and this gave me an idea. A current personal project of mine is creating 1,000 origami cranes within the course of a single year to bring eternal peace and wellbeing. I felt this was a sign of something meaningful and personal that I could leave as part of the diverse memorial, so I wrote a small message of peace on a scrap piece of paper, signed it on behalf of the organizations I was representing (Green Schools and Conserve It Forward), and folded it into a crane. I studied the items left by caring people from all parts of the world, found just the spot, and placed the crane. I knew I had done my part at this beautiful, solemn memorial. I was reluctant to leave in the morning. At the airport, statues hung from the ceiling, looking like circles gathering around each other, until the smallest circle hugged the oversized water drop at the center. I cannot help but think of this ripple effect, and how our planet Earth is at the center of all of our combined actions and efforts. As I reflect on my time in Paris, I realize how much I enjoyed the COP21 events, the people who gathered there to do good for the world, and of course the beauty and history of the host city itself. I loved the way the city smelled of old stone and sweet dew, combined with the modernity of the shops and people. I especially loved Le Bourget and interacting with the other students at the Mini COP event. I feel that my journey to Paris and involvement with COP21 were complete successes. I sincerely hope I can take what I learned from this year’s’ experience with me to COP22 in 2016 in Morocco. My goals would include staying longer, having more interactive opportunities, giving more presentations, and having more time to take part in activities that you do not even know about until you are there. Being part of an event like this is emotional. There are parts that remind me of so many challenges we face, yet there are so many more parts that give me hope and happiness for a brighter future. Reflection of all I have seen, felt, and learned is very important.The entire experience has been beautiful, and I look forward to doing it all again. Thank you to everyone who helped make this entire journey possible. Thank you to Green Schools for inviting me. Thank you to the people and organizations who helped ensure I was part of different events. Thank you to every single person and organization who shared my social media and GoFundMe posts and links. Thank you to those who donated. All of your support means so much to me. Thank you, everyone, for believing in me, and the voice of all youth. A note from the editor: Avalon is a recent alum of Youth Empowered Action (YEA) Camp, a life-changing camp for world-changing teens. At this week-long summer camp, teens aged 12-17 learn the critical skills needed to develop their passions into activism. Some are already very active, like Avalon was, and others know they want to get started making a difference but need help figuring out how. If you know of a teen who is interested in gaining the skills and knowledge to become a world-changing activist, whether it be environmental activism like Avalon or another form of social change, visit yeacamp.org. This entry was posted in Activist Profile, Activist Tips, gotv, Organizations to Know, social justice summer cmap, teen leadership camp, youth activism, Youth Empowered Action, youth leadership camp and tagged activism, activist, activist camp, avalon theisen, climate action, climate change, climate conference, conserve it forward, cop21, cowspiracy, environmental advocacy, environmentalism, environmentalist, france, green food, green schools, green schools project, paris, social activism camp, social justice, social justice camp, summer camp, tampa, teen advocate, teen camp, teen changemakers, unbound project, vegan, Vegetarian, yea camp, youth, youth activism, youth activist, youth empowered action, youth empowered action camp, youth environmental activism, youth environmentalism. Bookmark the permalink.